Russian billionaire’s purchase of French villa sets new world record for most expensive home -- $750 million! August 11, 2008 -- The market for the average priced U.S. residence may be soft, but the über rich (especially the Russians) continue to drive prices up at the very top of the world’s luxury market. 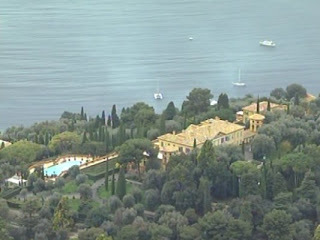 Case in point -- Villa Léopolda, one of the most historic estates on the French Côte d'Azur, is now under contract by an anonymous Russian billionaire for $750 million (€500m). This three-quarters-of-a-billion dollar sales price sets a new record for the most expensive home sale in the world. The previous record was set earlier this year by Indian billionaire Lakshmi Mittal, with the reported purchase of a London home for his son for an estimated $236 million. “While the French Villa is a fabulous property, this sale does put into perspective the value U.S. properties represent,” said Joy Martin, Broker and Owner of American Caribbean Real Estate in Islamorada and Marr Properties in Key Largo. “The most expensive residence on in the Upper Keys market is listed for just $9,245,000, and is exclusively marketed by American Caribbean Real Estate. It features 5 buildings on 6.78 acres on the Ocean. Villa Léopolda, a cream-colored, turreted mansion with two guest houses, is midway between Monaco and Nice overlooking Cap Ferrat, near Villefranche-sur-Mer. The villa was originally built about 1902 by King Leopold II of Belgium. The grounds are regarded as among the most spectacular on the Côte d'Azur. Fifty full-time gardeners look after 20 acres of gardens and terraces, planted with 1,200 olive, orange, lemon and cypress trees. The property has a unique history. In 1916, King Leopold’s nephew and heir, King Albert I, turned the villa into a hospital for officers wounded during the First World War. It later passed into the hands of the Agnelli family – Fiat automotive tycoons -- and became the scene in the 1960s for legendary jet-set parties attended by Frank Sinatra, Ronald Reagan (in his acting days) and other celebrities. Marr Properties Inc. in Key Largo and American Caribbean Real Estate in Islamorada are both members of The Institute for Luxury Home Marketing and have received special training in assisting upper-tier buyers and sellers. The Florida Keys is well-known for it’s spectacular ocean front estates overlooking the turquoise waters of the Atlantic Ocean and Florida Bay. Wondering what the top ten priced listings are in the Upper Keys? Here is a collection of the ten highest priced luxury single family homes in the Key Largo to Islamorada area, sure to dazzle even the most discriminating buyer.